I remembered that down the very back of the store they have a large banana box filled with fabric remnants & old textiles. I loved the combination of colours that someone had used ... it would not be colours I would put together but I adored it. 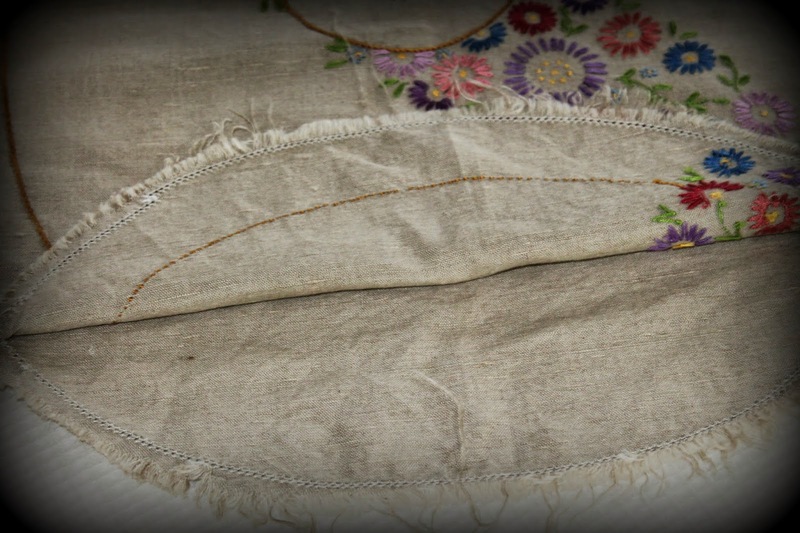 As it was two pieces of linen joined together - with holes to crochet a small picot edge - I wondered whether it had perhaps started out its life destined to be a cushion cover ?? It spent about 3 days on my lounge floor with several pieces of felt thrown across it ... this is how I choose which colours to use ... I have to "walk past it" over several days before I can decide. What do you think dear readers?? As I said earlier - not normally colours I would have chosen - but it definately adds a splash of cheer to my dull dining room . . .
My lovely friend Kerryn has recently been on a quick visit. 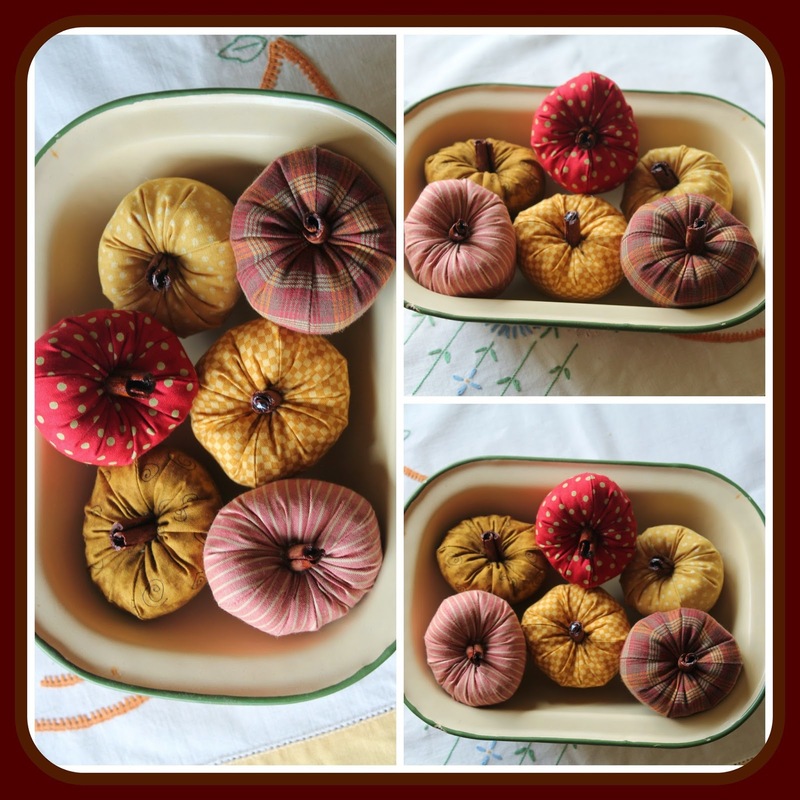 She purchased some of my fabric apples, but on her return home, realised she needed more to fill her tin dish, so she requested another 6 in "country colours please." I really enjoy making these little apples ... I think the pattern originally came out of a Tilda Book ... though I have long ago lost the instructions & am just left with the apple shape. Though you are supposed to insert a twig into the centre, I always use a small piece of cinnamon stick. My friend Pauline is turning 60 this weekend. Many of my friends & I have chosen to no longer exchange gifts ... we feel we all have enough "stuff" & would rather spend a pleasant couple of hours together enjoying a nice lunch to celebrate our birthdays. However I wanted to make something for Pauline as I feel those 10 year birthdays are quite special. The piece of white linen was in a bag of fabrics given to me. In the bottom of the bag was a pair of white ladies trousers - cut out - but never sewn up. 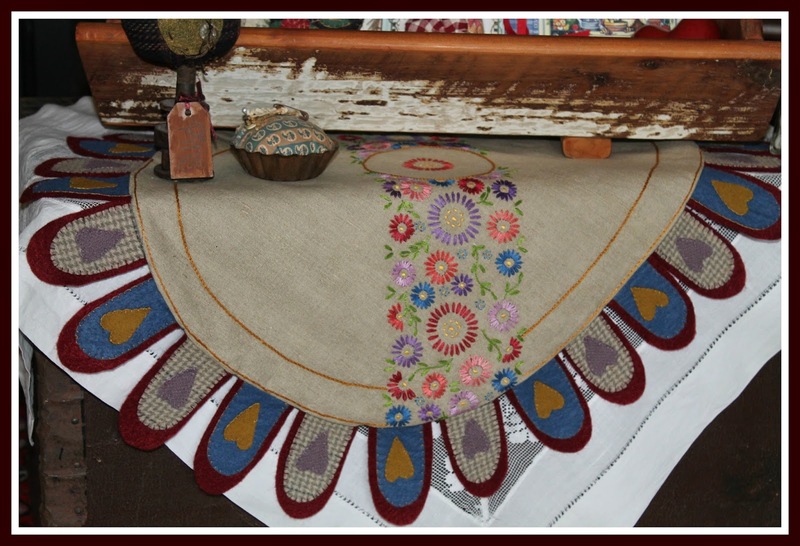 I have used the linen for lots of projects now. The saucer base screws into a green garden stake & can be easily moved around the garden. 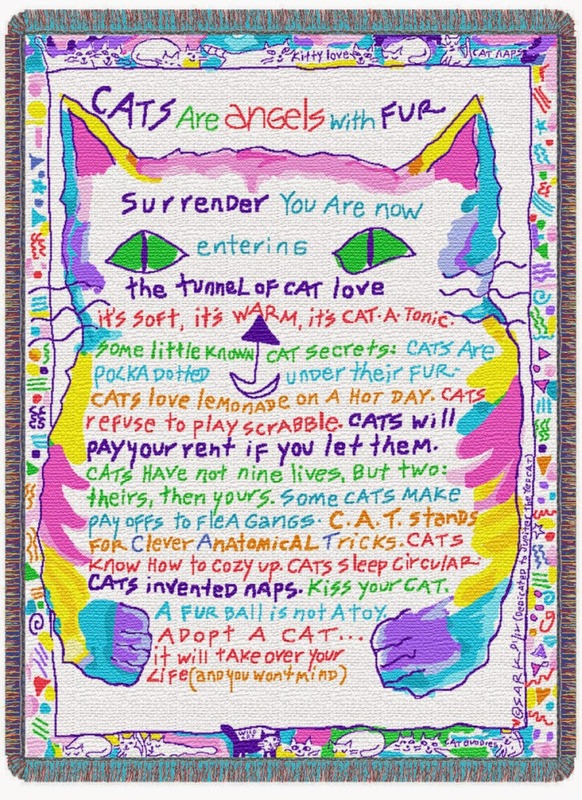 My dear friend Catherine sent me this really delightful little verse about "angels with fur"
I just loved it, but I was having an email conversation with friend & fellow cat-lover Willie ... & we both agreed we were not too sure about the sentence "cats will pay your rent if you let them" !!! I am off to my Mums on Sunday for a few days - she is turning 86 - so I will have no internet until my return. Happy Birthday to your Mum. Love the cat verse, cats certainly do have a good life, always say I am coming back as our cat,except for the eating of mice and rabbits! 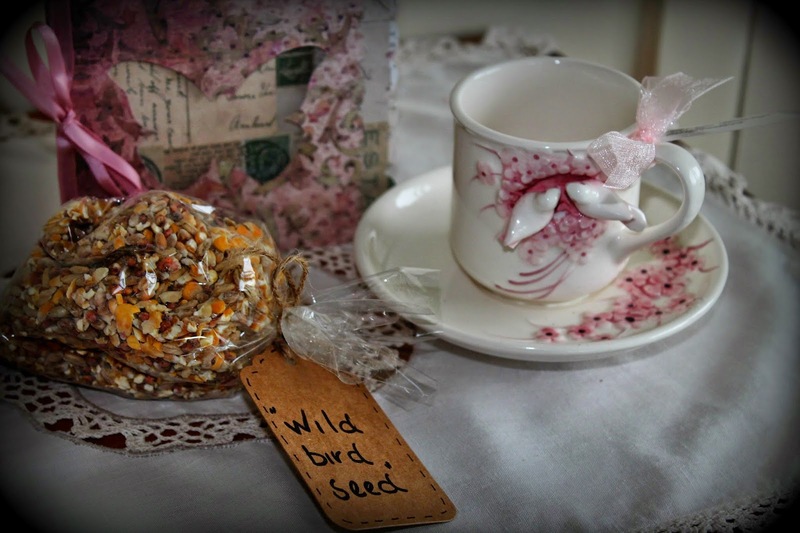 Pauline's birds are going to be spoilt with that beautiful cup as a birdfeeder. 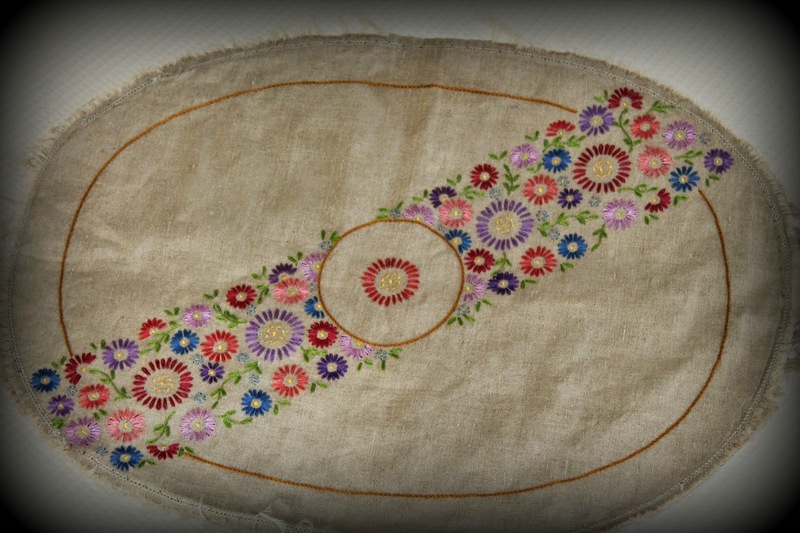 There is nothing lovelier than refashioning some embroidered pretty, lovingly embroidered by someone in a bygone era. 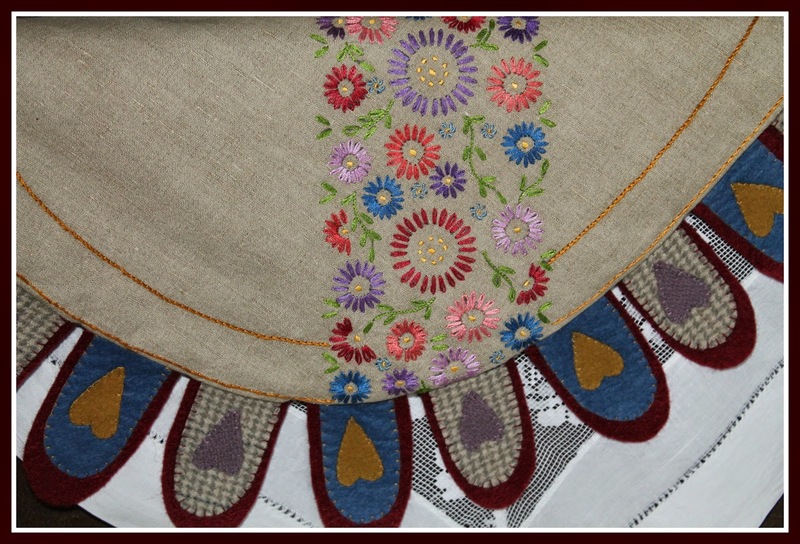 It is gorgeous AND it's new transformation by your clever stitching fingers is divine. Ain't op shops the best! 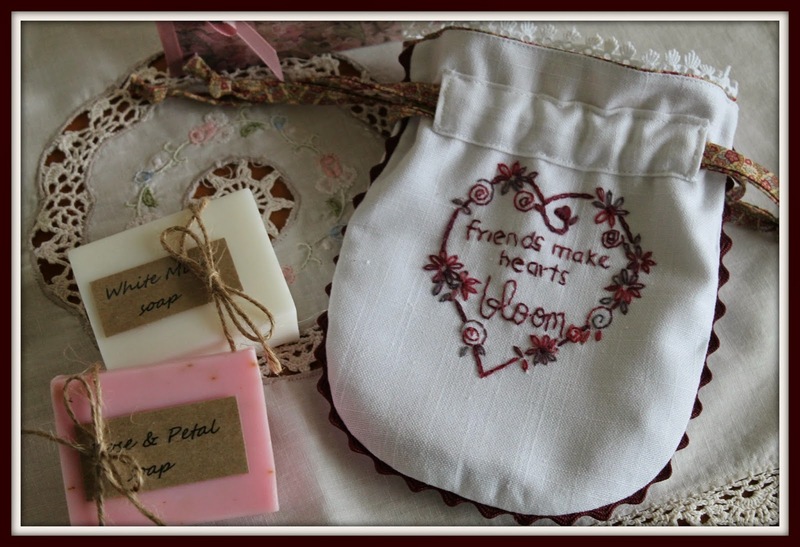 Pauline is a lucky gal; some gorgeous gifts you have made, Julie! Have the most wonderful celebration with your mum. As for your Blackie....he is one very shrewd puddy cat!! happy birthday to pauline! i think she will adore your gifts, i certainly do! Wow I love what you have done with your op shops find Julie. I look forward to seeing your lovely apples next time I visit Kerryn. Your friend sure is going get a stunning birthday gift. Bet she will always treasure it. 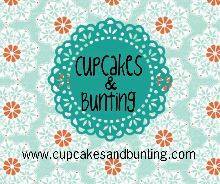 I just love reading your blogs, it reminds me of having a pen pal many years ago. I adore cats, we have a beautiful little girl "Daisy" who we adopted from the SPCA last year. Did you see the "Secret Life Of Cats" last weekend on TV One, if you didnt go online and have a look you will love it. The transformation of that old cloth is fabulous Julie, I looooooove it!!! Do say happy birthday to your dear mum for me and enjoy your time away. I expect a full report on what you find on your return. Safe travels. 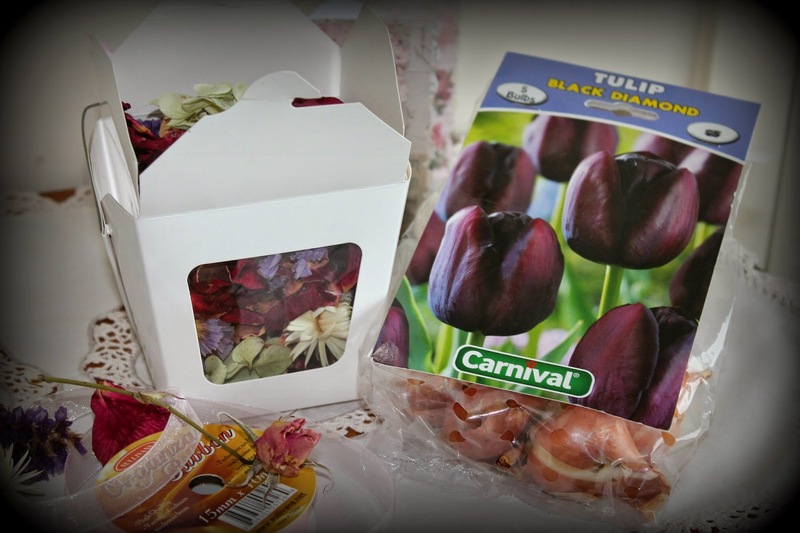 Lovely gifts for your friend's special birthday - the pot pourri looks beautiful/colourful and the noodle box is a clever idea. Will miss your posts while you are away, happy birthday to your mum! p.s. 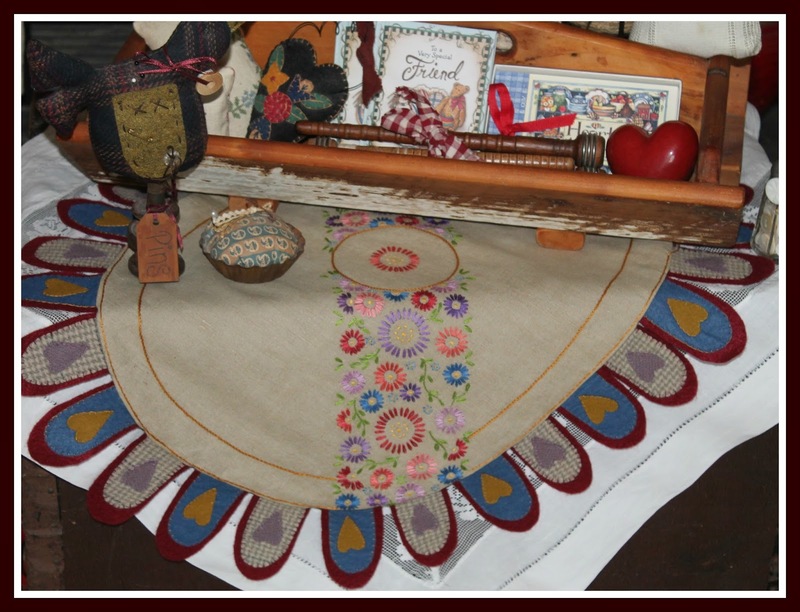 the ancient embroidery has been put to good use, it's nice to see something very old and pre-loved getting a new lease of life. tight trousers...(As they say). :). But l do like the embroidered linen, and what you did with. as girls over there, and still are, mostly out in the small villages. settee in my front room...! But it ALL looks lovely as ever Julie! like Blackie any rent....or any cat for that matter....He's lovely! :). over here....Sun's out, and has been for the last couple days. Managed to get out in the garden and tackle the weeds...And won! :>). 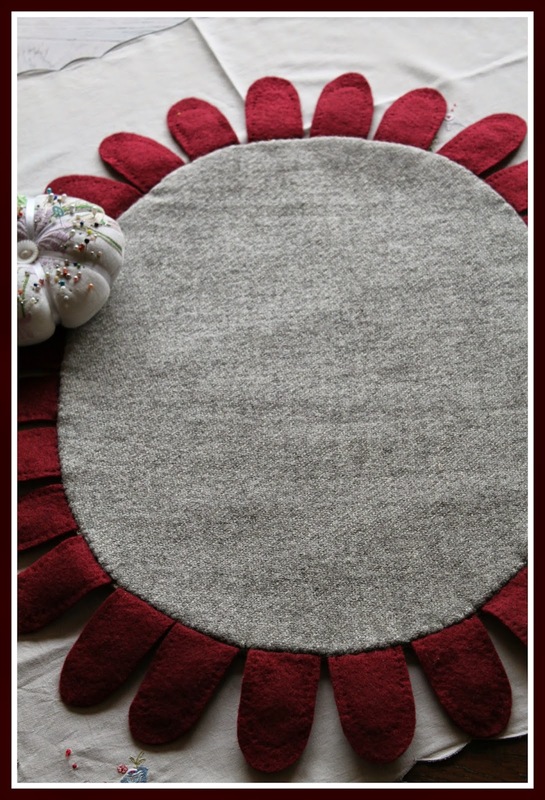 Your penny rug has turned out fabulous, you did a great job working the stem stitch and finding a colour to match. Tell me when I visit am I transported to another house? Because there is not one part of your lovely home that is dull, not even the loo! 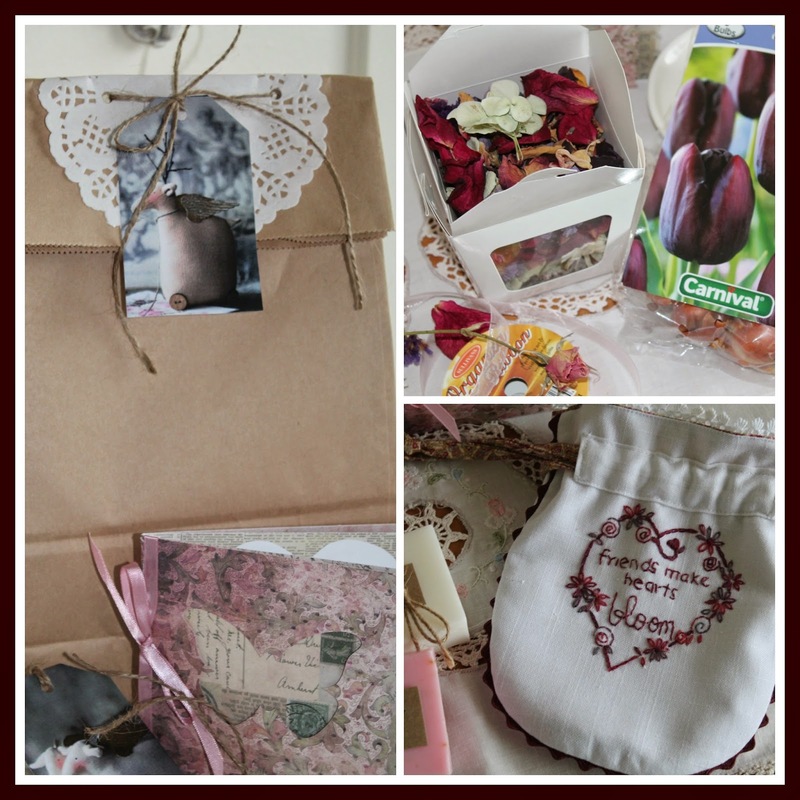 Lovely gift for your friend, I am sure she will love it and the effort you have gone to as well as the lovely gift wrapping. Blackie will be pleased me and my 'spaceship' have exited HIS domain! I have only just unpacked my yummy goodies purchased from your cottage. Thank you my friend! Happy Birthday with your Mother. I am almost jealous, that you stil have her. Hello Rya, Thank You - I will pass on your wishes to my Mum when I see her. 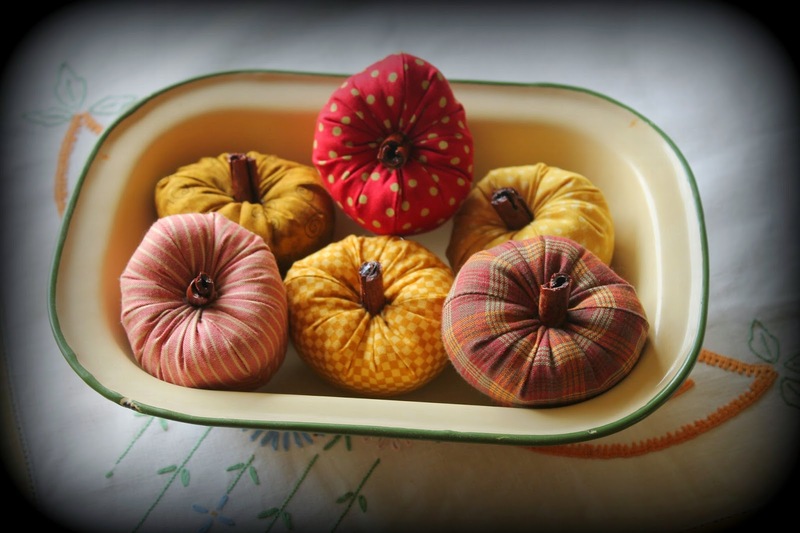 I love what you did with the embroidered linen, and your fabric apples are gorgeous! 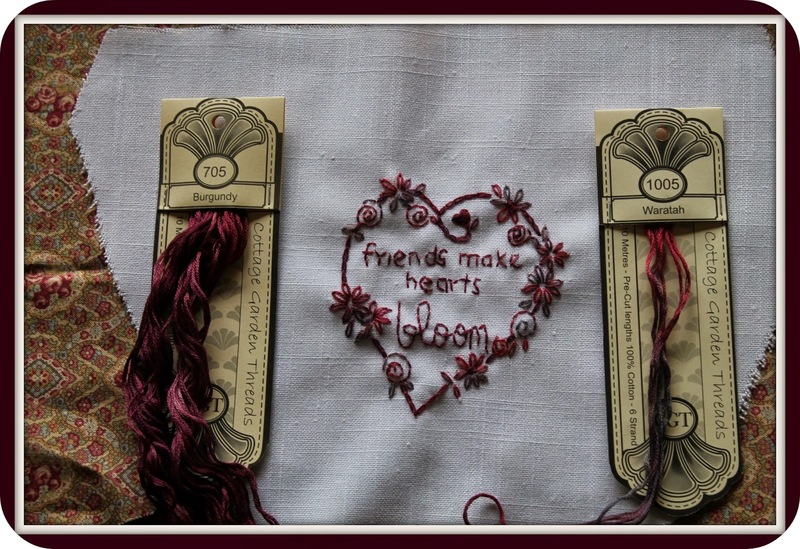 Love what you have done with the embroidery Julie., like a crossover from two worlds! Your friend is lucky to receive such beautiful gifts. Love the drawstring bag!. have a wonderful time with your Mother. Mine will be 86 in December. 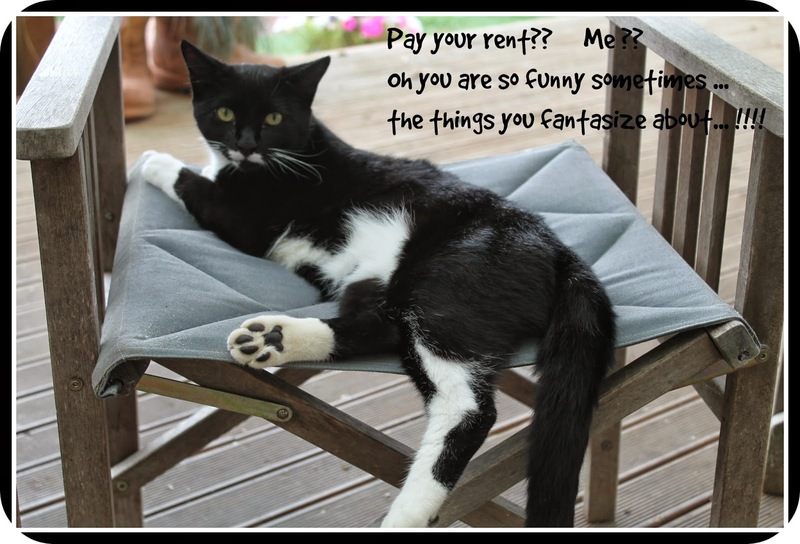 Love the poem about cats I agree with Willie Cats pay rent! we should be paying them for all the unconditional love they give us, well I do wonder there is an element of cupboard love at times?!!! The look on your Blackie's face says it all, very indignant.I always get the thought when I see a photo of Blackie, "What is Ambrose doing there!" Even their mannerisms are similiar. Have a happy visit. Você tem mãos e fada. I love what you've done with your vintage find. 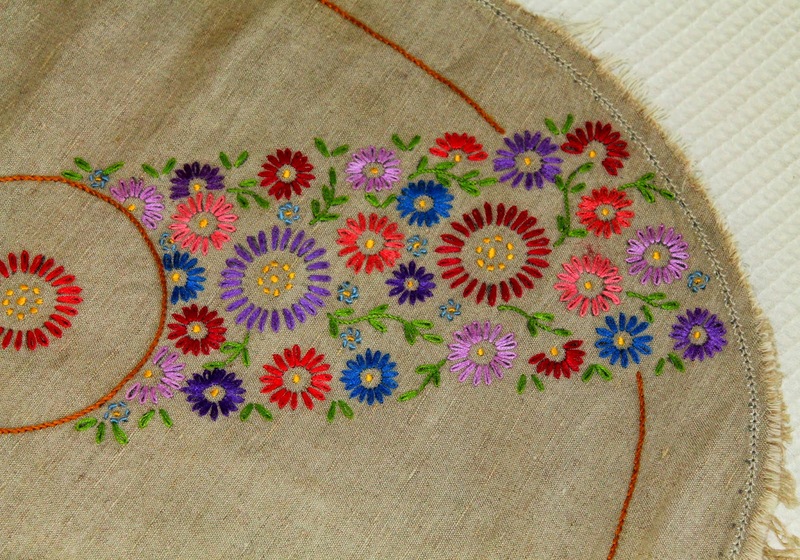 I love how you saved the embroider linen and gave it new life. Wonderful!